Tony-winning musical Jersey Boys will celebrate this year’s holiday season with the release of their new Christmas album. 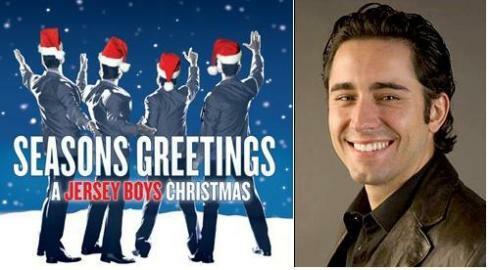 Seasons Greetings: A Jersey Boys Christmas features Tony winner John Lloyd Young, current Broadway star Jarrod Spector and cast members from around the globe singing a selection of Christmas classics in the style of The Four Seasons. The Rhino record is set for digital and physical release on October 4. The holiday album features performances by six stars from various Jersey Boys casts, including Joseph Leo Bwarie (national tour), Travis Cloer (Las Vegas), Rick Faugno (Las Vegas), Bobby Fox (Australia), Ryan Molloy (London), Jarrod Spector (Broadway) and John Lloyd Young, who won the 2006 Tony Award for his portrayal of Frankie Valli in the original Broadway production. A Jersey Boys Christmas was produced by Bob Gaudio, a founding member of The Four Seasons and the group’s principal songwriter, who also produced the show’s Grammy-winning original cast album. Jersey Boys arranger Ron Melrose served as musical director and arranger on the project, and the album was engineered by Pete Karam, who also won a Grammy for his work on the Jersey Boys original cast recording. According to press notes, “Many of the melodies and choral harmonies that catapulted the quartet from the streets of Newark into the Rock and Roll Hall of Fame are woven into classic holiday songs on ‘Season’s Greetings: A Jersey Boys Christmas.’ Listen for hints of ‘Come On Marianne’ and ‘Oh What A Night’ in the album opener ‘Joy To The World/O Come, O Come, Emmanuel’ plus traces of ‘Bye Bye Baby’ in ‘Winter Wonderland.’” The album will also include a new arrangement of “O Holy Night,” a song that the Jersey Boys cast recorded in 2006 and was featured on a Christmas album to benefit Broadway charities. Jersey Boys Tickets are selling as hot cakes for the coming holidays. Buy Jersey Boys Musical Tickets Online.